The Historic Walled Town of Cuenca is a medieval fortified city built on a limestone ridge. It has Moorish origins, and was conquered by the Christians in the 12th century. The new Christian town was built over the Moorish one. It was subsequently transformed into an episcopal see and Royal Town. Cuenca flowered mainly in the 16th century because of its textile industry and trade. The Upper Town is Cuenca's historic heart, with the cathedral, aristrocatic houses, monasteries, churches and the remarkable "Hanging Houses". The lower town that is also included consists of the medieval working-class suburbs of San Anton and Los Tiradores. Cuenca is the most touristy town that I have encountered so far on this trip. Its forte is ‘location, location, location’ – even the AB evaluation couldn’t get much further than appraising the synergy of the man-made constructions with the natural landscape. The rocky hill on which it is located has very steep slopes, so even in the old city center you keep on climbing. There’s not a whole lot more to see than views on the houses that cling to the rocks or over the surrounding countryside. I had to wait 30 minutes before my hotel room was ready, and in the mean time I managed to take in all major viewpoints including the one from the large bridge that crosses the ravine. Some groups of houses are painted in various bright colours, which is definitely picturesque. The surprising highlight of Cuenca for me was the Cathedral. Its façade dates from the early 20th century and is a weird kind of Neo-Gothic: it looks like part of it has blown away. Its interior is a whole different story. They charge a 3.80 EUR entrance fee which includes an audioguide. Both are quite unusual for a religious building, but as you step in further it immediately becomes clear that behind the entrance lies a wealth of medieval and renasissance art. The decoration is very exuberant, both in colours and in ornamentation. The audiotour has no less than 37 stops, and doesn’t even cover all chapels. Its showpiece is number 33, the Jamete Arch, an enormous 16th century sculptured doorway that leads to the cloister. Cuenca makes a good stopover between the Mediterranean coast and Madrid, and the location of the Old Town is quite spectacular. Apart from that, though, I have to say that I didn't enjoy the place very much (ok, it was very cold and rainy, as opposed to heat and sunshine just a couple of hours before on the coast). It was just very grey and dreary, and the "casas colgadas" didn't strike me as particularly noteworthy either. The cathedral was quite nice, but also just one of many in Spain. 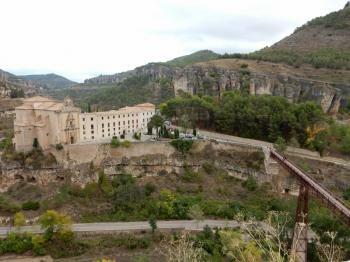 The best thing about Cuenca was my stay in the parador on the other side of the gorge. It is a 16th-century Dominican convent with very nice rooms and a great breakfast (my first stay in a parador), and to reach the Old Town, you have to cross the narrow bridge that can be seen in many pictures of Cuenca. From the top of the Old Town, by the castle ruins, there are great views of the parador and the gorge. In June 2014 I arrived with friends by train from Valencia, which took only an hour or so. Cuenca's un-picturesque new town sprawls around the base of the hills, and isn’t exactly what tourists come expecting to see. Not to worry though, as walking up the hill proved to be well worth it, putting us in a town that time forgot. Cuenca’s centrepiece is its cathedral, built 1182-1270, which was the first Gothic cathedral in Spain. We went inside for the audio guide tour (€3.80). The next day we explored this small town further. It was about midday, the sun was beating down and the views were amazing. Exploring the rocky outcrops, it felt like the wild west. More Mexico than Spain. There weren’t really any safety barriers, so you were pretty much free to walk around and fall off as you pleased. I like that freedom to take your own risks. 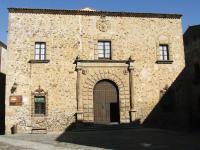 Cuenca has other museums – I briefly visited the Cuenca Museum, which is dedicated to the history of the area. It didn’t really work for me, though, as the displays are solely in Spanish. I visited this WHS in June 2015 as a day trip from Alcala de Henares which is only just over 1.5hrs away. I travelled by rental car through the uninspiring new part of Cuenca and up to the very top of Old Cuenca to park next to the remains of the Castle and walls. From there it was only a short downhill walk to the Gothic Cathedral and the colourful square. Just behind the cathedral are a few narrow roads that lead to the hanging houses of Cuenca. There are some other minor churches worth visiting and I would recommend crossing the long bridge to the other side of the valley if you're not afraid of heights. The best way to admire the few hanging houses remaining is in fact from the opposite side of the valley. It was the highlight of my visit even though I must say I wasn't overwhelmed with the OUV of this site. South East Asia (and Asia in general) is full of similar panoramic views and hanging houses, most of which are more authentic than the restored hanging houses of Cuenca even though they are not inscribed in the list. All in all, I'm glad I visited this WHS now so that when I visit Valencia in the future I could focus more on visiting the remaining Mudejar sites around Teruel which I think are much more interesting than Cuenca overall. To save the long climb from the station to the Old Town, I took a bus from the station (#1 or #2) to the castle area. From here there is a panoramic view of the Huecar Valley, the hanging houses and the Tiradores district. From the castle it is a pleasant stroll down to the Plaza Major with its handsome town hall and ugly cathedral. Crossing to the west side of the plaza there is an interesting view down the Jucar Valley to the San Anton district. Passing the excavations of an old mosque, I continued downhill to visit the San Anton and Tiradores districts on my way back to the station. 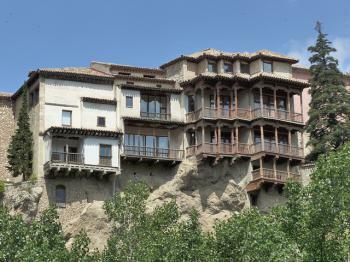 We visited Cuenca in 2000 staying in the hotel cueva del Fraille just outside the town. The rock formations surrounding Cuenca are amazing. When visiting Encantada make sure you stop off at mirador del Diablo(devils window). We were lucky to be in Cuenca at the time of a religious festival and were able to join in the parade. A really friendly place to be. My husband and I were fortunate to be traveling in Spain in October/November of 2003. We rented a car in Barcelona and traveled down along the coast on a 3 week trip making stops here and there and eventually ending up in Sevilla. I had done plenty of research before leaving and Cuenca was one of the places that sounded fascinating. It ended up being the place we enjoyed staying at the most. Up in the higher elevations from where we had been traveling on the coast, it was very crisp in late autumn. We stayed at the very charming Posada de San Jose, which was quite an adventure just to find. The casas colgadas (hanging houses) were wonderful and the old city magical. There were some wonderful pottery shops in the Plaza Mayor close to the posada, and I bought some pieces to bring home with me. the unusual rock and geologic formations. Wonderful scenery all the way there and back. We took the circular route. 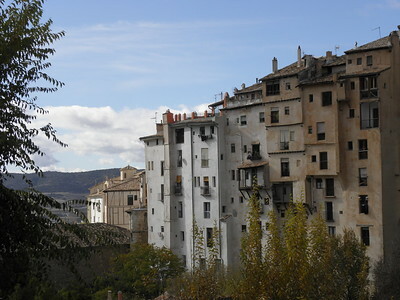 All in all, Cuenca is not to be missed if you enjoy history and beautiful scenery. I hope to return some day.